We will be traveling in the RV but some of us want to spend the night in the hotel, others want to stay in the RV. 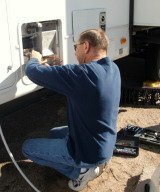 Will hotels let you stay in the RV with generator running as long as you are paying for a room? I would first call the hotel and ask their permission. Also it may also depend on if you have an ultra quiet generator or not.